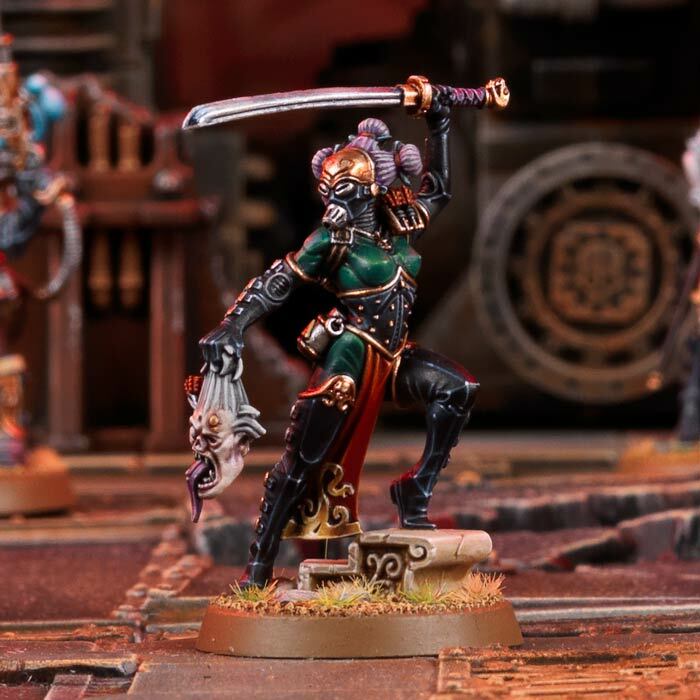 Kill Team Elucidian Starstriders coming for pre-order soon! 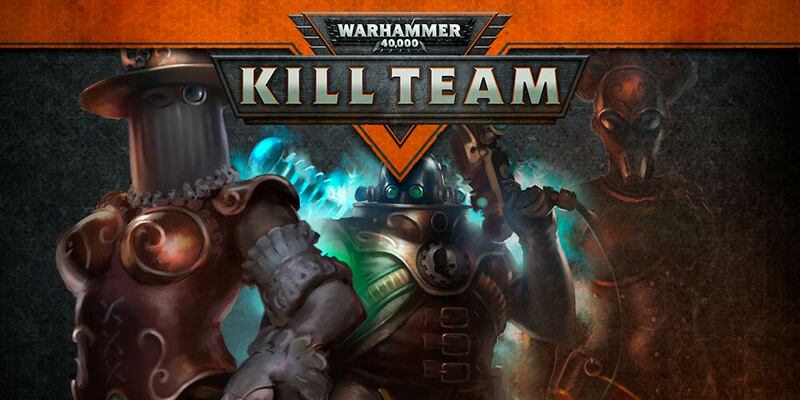 There is no doubting that Games Workshops Kill Team is a runaway success and most likely one of the gaming must haves of 2018! The success just seems to grow and grow and now its first full on expansion is about to take the game in a new direction! Look out for our review and a chance to win a copy very soon on Gamers Web! 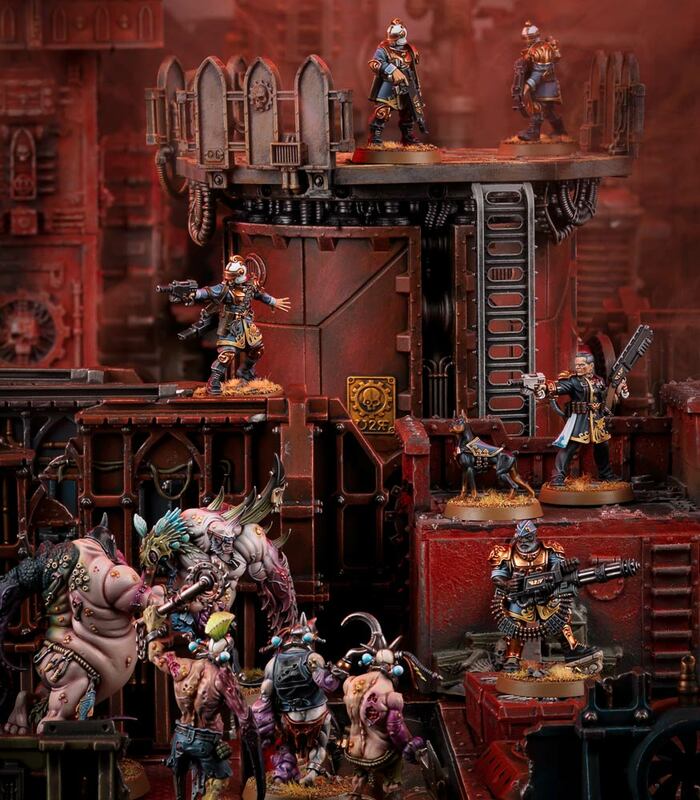 Not to worry – her loss is your gain, as Kill Team: Rogue Trader features a new kill team comprising the embattled survivors of the disaster aboard the New Dawn. 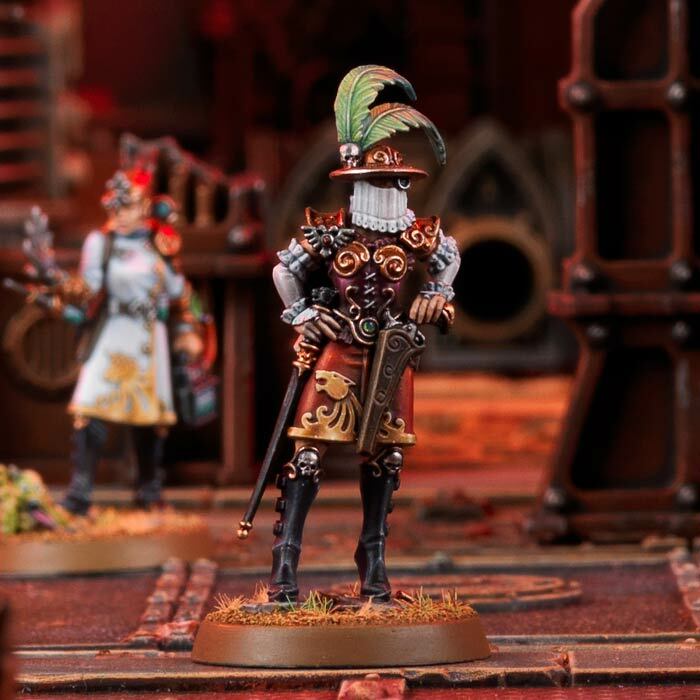 The Elucidian Starstriders are an eclectic band of heavily-armed and well-equipped naval soldiers and aides-de-camp, led by the Rogue Trader from whom they take their name, Elucia Vhane. The design of the miniatures was driven by concept art produced by none other than legendary artist John Blanche. The Imperial Gothic styling of Elucia Vhane’s uniform clearly bears the hallmark of John’s grim, dark vision of Warhammer 40,000. Rogue Trader dynasties are so powerful that they function more as large corporations, with many different institutional branches and departments. This is represented by the many different icons displayed on the uniforms of the Elucidian Starstriders, which depict their role within the wider infrastructure. Knosso Prond, Larsen van der Grauss and Sanistasia Minst are always Combat, Comms and Medic specialists respectively. However, they don’t count towards your normal limit of specialists! 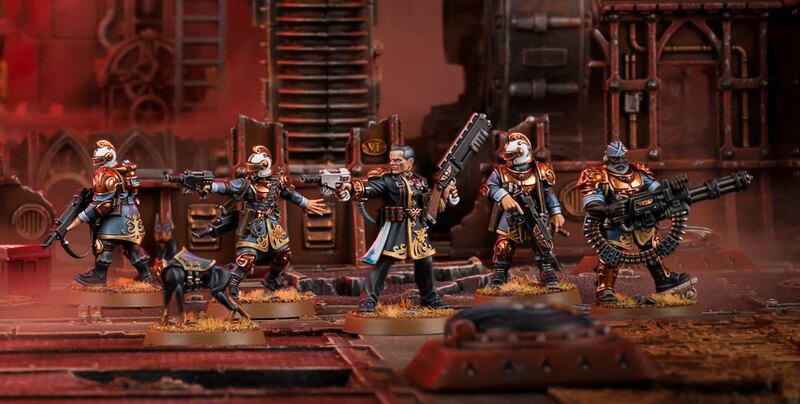 It you want a kill team that that is brimming with specialists, look no further than the Elucidian Starstriders! Between them, the Elucidian Starstriders are equipped with an array of exotic and deadly firearms, from Grell’s rotor cannon and Nitsch’s artificer shotgun to van der Grauss’ voltaic pistol and the heirloom pistol of Elucia Vhane herself. With extensive background stories and individual personalities, the Elucidian Starstriders are like an all-star cast in an action movie – and they’re yours to command! Rogue Traders spare no expense when it comes to personal protection, and Voidsmen-at-arms are amongst the best money can buy. Voidmaster Nitsch is like a hero unto himself, with a profile worthy of a senior officer of the Astra Militarum. His squad all come with BS 3+, providing accurate fire support, not to mention the killing power of Stromian Grell’s rotor cannon (which fires 4 shots at Damage 2!). Oh, and don’t forget their swift and loyal canid, Aximillion! Elucia Vhane is accompanied by an inner circle of highly skilled retainers:the Death Cult Executioner Knosso Prond, the eccentric Lectro-Maester Larsen van der Grauss, and her Rejuvenat Adept, Sanistasia Minst. Their unique wargear and abilities offer the Elucidian Starstriders three distinct advantages with their deadly combat prowess, the protection of a Voltagheist Array and Healing Serum respectively. 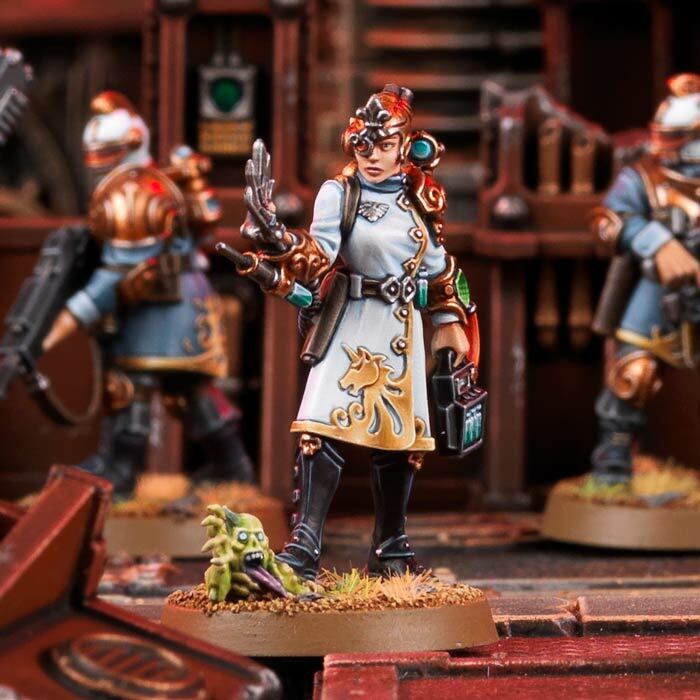 The beating heart of the Elucidian Starstriders is of course the Rogue Trader herself. Elucia Vhane hails from a different class to her subordinates in that she is a Commander, complete with a vastly superior profile and access to a previously unseen specialism – Strategist. Not only that, but she can be upgraded to levels 2, 3 or 4 right from the start, and can be further augmented by traits such as Trader Militant, which grants her +1 Attack. Elucia Vhane is a skilled combatant, equally at home sharpshooting with her heirloom duelling pistol as she is cutting down those that dare stand in her way with her trusty monomolecular cane-rapier, Blur. One of her greatest assets is the ability to use her Multi-spectral Auspicator Tactic, which enables you to re-roll hit rolls of 1 for any Elucidian Starstrider models within 6” of her for the duration of the battle round. 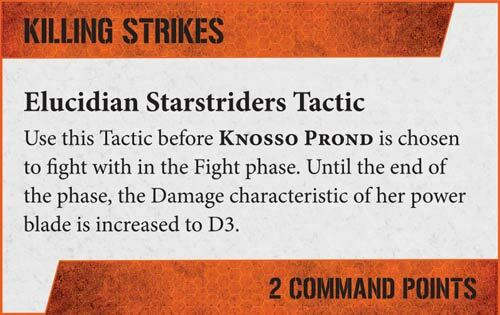 As one might expect from an elite band of survivors, the Elucidian Starstriders have a number of useful Tactics up their (immaculately cut) sleeves. 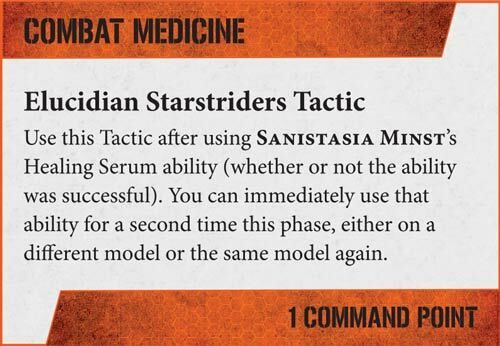 If need is dire, use this tactic to enable Sanistasia Minst to apply her Healing Serum twice, potentially patching up two flesh wounds! This is a great tactic to use for some additional staying power if you’re up against it (or to try and avoid a potentially disastrous roll on the Casualty table). Dug-in enemy shooters causing you problems? 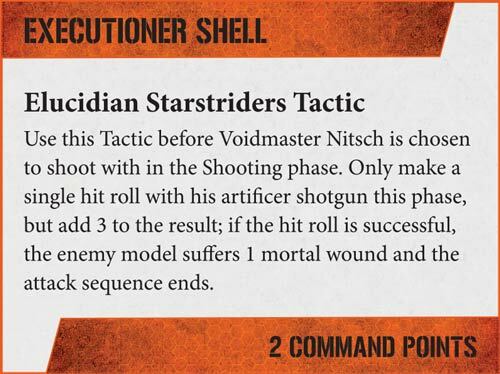 Use this tactic for a +3 bonus on Voidmaster Nitch’s hit roll which, if it hits, inflicts a mortal wound on the target! It costs 2 Command Points, but can really help to get you out of a tight spot. 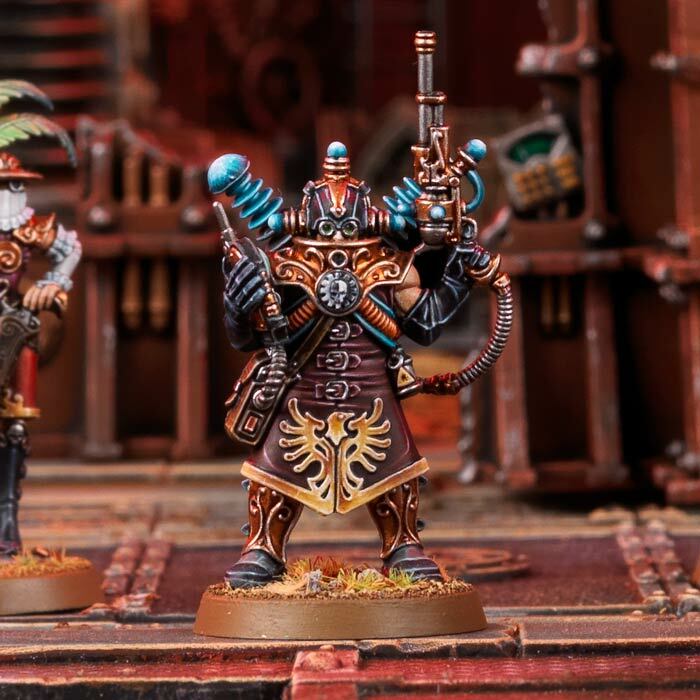 The Elucidian Starstriders are available in the Kill Team: Rogue Trader box, which is up for pre-order from this weekend. Order your copy direct from Games Workshop or your local stockist! All images copyright Games Workshop and used for promotional purposes only, all rights reserved!